INDIANAPOLIS – Citizens Energy Group’s DigIndy Tunnel System project reached a significant milestone on Wednesday when its 20-foot-diameter underground tunnel boring machine completed mining the Lower Pogues Run and White River Tunnels. (See Media Resources for B-roll of the event). Mining is now complete on four of six tunnels and 17 of 28 miles. The Lower Pogues Run and White River Tunnels comprise more than seven miles of the DigIndy Tunnel System. Work to prepare the two new segments to capture raw sewage is ongoing, and the tunnels are on schedule to be online by 2021. 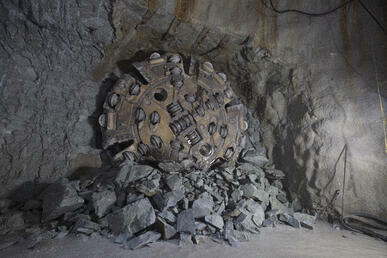 Meanwhile, Citizens’ tunnel boring machine will move on to mine the 3.4-mile Fall Creek Tunnel. Upon its completion, mining will begin on the tunnel system’s final segment, the 7.6-mile Pleasant Run Tunnel. The first 10 miles of the DigIndy Tunnel System (composed of two tunnel segments) entered into operation at the end of 2017. To date, the Deep Rock Tunnel Connector and Eagle Creek Tunnel have prevented more than 900 million gallons of sewage from entering White River and Eagle Creek across the southern half of Marion County. When the full 28-mile DigIndy Tunnel System is complete in 2025, up to 99 percent of raw sewage, or 6 billion gallons annually, will be prevented from entering waterways in Marion County, thus enhancing recreational opportunities and further protecting our water supply, while also helping drive neighborhood revitalization and economic development across the city.